Peck has unearthed one of the hoariest of chimney-corner romantic devices--the wobbly course of love and intrigue when two young things of diverse origins and temperament look exactly alike and cross destinies; and he displays it here in late-Edwardian satin, with agile prose and a straight face. Amanda, witchy and beautiful daughter of Lady Eleanor and Sir Timothy Whitwell of the Isle of Wight and London, has been born to command. . . while her look-alike, poor Mary Cooke (renamed Miranda), has been trained, in a hard-scrabble childhood, to serve. Thus, when Amanda begins thrashing with passion for chauffeur John Thorne, she snares Miranda for her personal maid and plots to marry her to Thorne. The plan succeeds--and Amanda, three months pregnant with Thorne's child, then accepts the proposal of nice idealistic American Gregory Forrest. The wedding is to be in New York, and with Thorne and Miranda attending the bridal couple in America, Amanda can carry on her affair with Thorne with Miranda as a visual cover. (Anyone would assume the woman in his arms to be wife Miranda.) 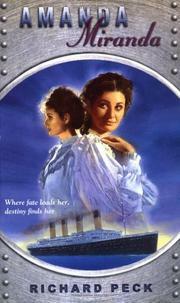 So off go the two women to America--on the Titanic, of course--and in the midst of mid-Atlantic disaster, Miranda (though bitter about her mistress' nasty doings) tries to save Amanda. . . who dies in the cabin of a shipboard lover. (Thorne will take another liner.) Miranda is just barely rescued, badly injured about the face, and--what else? She drifts into the role of Amanda, marries an initially-fooled Gregory (Thorne visits, penetrates the disguise, but takes a decent farewell), has two children with her loving husband, and (very sweetly and quietly) has the soft last laugh. Throughout, there are subplot and character diversions aplenty: a dark ghostly matter involving the Whitwell's "dead" son; the bright pan-banging gossip of servants; the mayfly nuptial dance of a straggly housemaid. And the proceedings are always accompanied by parades of viands and sumptuous living. All in all, a gorgeously romantic, implausible affair comfy as eiderdown.